A Lunar eclipse occurs during an alignment of the Sun, Earth and Full Moon, resulting in the Full Moon gradually darkening as it moves into the Earth’s shadow. 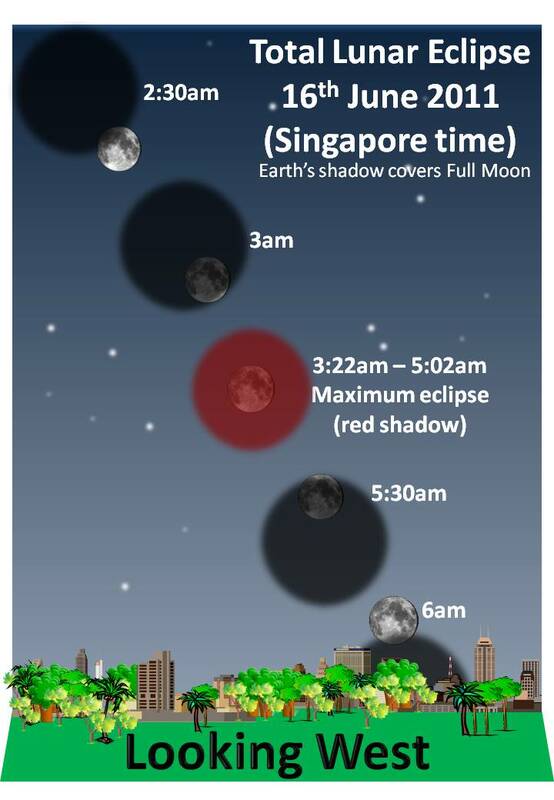 In Singapore, this eclipse occurs in the early morning hours of Thursday 16th June. It is the longest lunar eclipse since July 16th 2000. 1:22am – Penumbral phase – The Moon enters the outer edge of Earth’s Shadow (penumbra). This shadow maybe light and not very obvious. 2:22am – Umbral Phase – The Moon enters the darker, inner part of Earth’s shadow (umbra). Over the course of an hour, the dark grey shadow gradually moves across the face of the Moon. 3:22am-5:02am – Totality – The Moon is completely covered by the Umbra and turns red/orange in colour. 5:02 – 2nd Umbral phase – The Moon reaches the opposite edge of Earth’s umbral shadow. It begins to reappear as the shadow gradually recedes across its surface. 6:02 – 2nd Penumbral phase – The Moon is completely visible again, although not at full brightness as it is still inside the lighter, penumbral shadow. 7:00am – Eclipse ends – The Moon exits the penumbral shadow of the Earth’s and returns to full brightness. At this point the Moon may be too low to see. Lunar eclipses do not require any special equipment to be seen. They are easily visible to the naked eye, due to the Moon’s large apparent size and brightness. Choice of location is important. 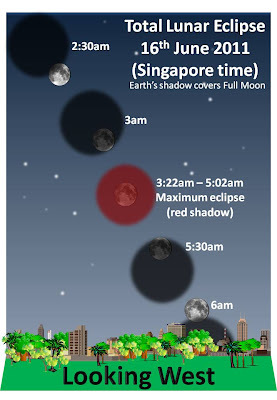 As this eclipse occurs in the early hours of the morning, observers must have a clear view of the west direction, unobstructed by trees or tall buildings. Open parks, fields and reservoirs often make good locations. Join us at the Red Moon Spectacle Event, at The Lakeside @ Omni-Theatre (Jurong Town Hall Road, besides Snow City). 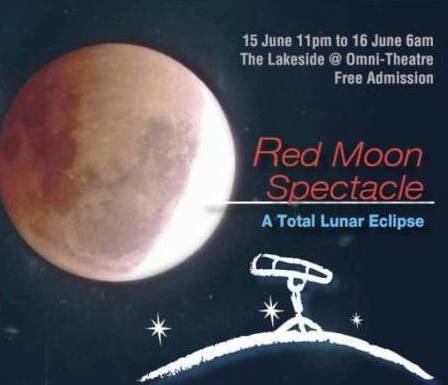 Bring a mat and observe the eclipse overlooking Jurong Lake, as well as outdoor movie screenings starting from 11pm. In the event of thick clouds and/or rain, the lunar eclipse will not be visible.